An intensive care unit, or ICU, is a specialized section of a hospital that provides comprehensive and continuous care for persons who are critically ill and who can benefit from treatment. The purpose of the intensive care unit (ICU) is simple even though the practice is complex. Healthcare professionals who work in the ICU or rotate through it during their training provide around-the-clock intensive monitoring and treatment of patients seven days a week. Patients are generally admitted to an ICU if they are likely to benefit from the level of care provided. Intensive care has been shown to benefit patients who are severely ill and medically unstable—that is, they have a potentially life-threatening disease or disorder. 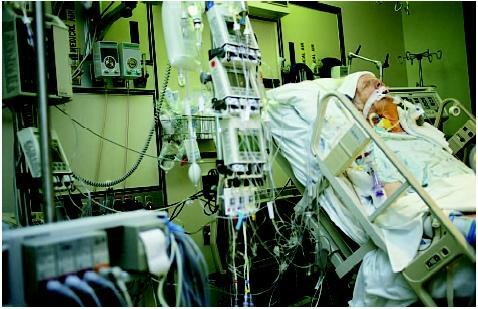 Critically ill patients in a medically unstable state who require an intensive level of care (monitoring and treatment). Patients requiring intensive monitoring who may also require emergency interventions. Patients who are medically unstable or critically ill and who do not have much chance for recovery due to the severity of their illness or traumatic injury. Patients who are generally not eligible for ICU admission because they are not expected to survive. Patients in this fourth category require the approval of the director of the ICU program before admission. ICU care requires a multidisciplinary team that consists of but is not limited to intensivists (clinicians who specialize in critical illness care); pharmacists and nurses; respiratory care therapists; and other medical consultants from a broad range of specialties including surgery, pediatrics, and anesthesiology. The ideal ICU will have a team representing as many as 31 different health care professionals and practitioners who assist in patient evaluation and treatment. The intensivist will provide treatment management, diagnosis, interventions, and individualized care for each patient recovering from severe illness. A large and comprehensive study conducted in 1992 by the Society of Critical Care Medicine in collaboration with the American Hospital Association found that approximately 8% of all licensed hospital beds in the United States were designated for intensive care. The average size of an adult or pediatric ICU averaged 10–12 beds per unit. Small hospitals with fewer than 100 beds usually had one ICU, whereas larger hospitals with more than 300 beds usually had several ICUs designated for medical, surgical, and coronary patients. Smaller hospitals do not usually have a full-time board-certified specialist in critical care medicine, whereas larger medical centers generally employ certified intensivists—60% of hospitals with more than 500 beds had full-time specialist directors at the time the survey was conducted. With regard to the nursing staff in ICUs, the proportion of nurses with specialized and advanced training in critical care medicine is higher in larger medical centers—about 16% in hospitals with 100 beds or fewer, but 21% in hospitals with more than 500 beds. Most pediatric ICUs have four to six beds per unit. The mortality rate in pediatric ICUs tends to increase in proportion to size, with larger units reporting more deaths (approximately 8% in the larger units). Eighty percent of pediatric ICUs have full-time medical directors. ICUs are highly regulated departments, typically limiting the number of visitors to the patient's immediate family even during visiting hours. The patient usually has several monitors attached to various parts of his or her body for real-time evaluation of medical stability. The intensivist will make periodic assessments of the patient's cardiac status, breathing rate, urinary output, and blood levels for nutritional and hormonal problems that may arise and require urgent attention or treatment. Patients who are admitted to the ICU for observation after surgery may have special requirements for monitoring. These patients may have catheters placed to detect hemodynamic (blood pressure) changes, or require endotracheal intubation to help their breathing, with the breathing tube connected to a mechanical ventilator. In addition to the intensivist's role in direct patient care, he or she is usually the lead physician when multiple consultants are involved in an intensive care program. The intensivist coordinates the care provided by the consultants, which allows for an integrated treatment approach to the patient. Nursing care has an important role in an intensive care unit. The nurse's role usually includes clinical assessment, diagnosis, and an individualized plan of expected treatment outcomes for each patient (implementation of treatment and patient evaluation of results). The ICU pharmacist evaluates all drug therapy, including dosage, route of administration, and monitoring for signs of allergic reactions. In addition to checking and supervising all levels of medication administration, the ICU pharmacist is also responsible for enteral and parenteral nutrition (tube feeding) for patients who cannot eat on their own. ICUs also have respiratory care therapists with specialized training in cardiorespiratory (heart and lung) care for critically ill patients. Respiratory therapists generally provide medications to help patients breathe as well as the care and support of mechanical ventilators. Respiratory therapists also evaluate all respiratory therapy procedures to maximize efficiency and cost-effectiveness. Large medical centers may have more than one ICU. These specialized intensive care units typically include a CCU (coronary care unit); a pediatric ICU (PICU, dedicated to the treatment of critically ill children); a newborn ICU or NICU, for the care of premature and critically ill infants; and a surgical ICU (SICU, dedicated to the treatment of postoperative patients). Persons who are critically ill may be admitted to the ICU from the emergency room, a surgical ward, or from any other hospital department. ICUs are arranged around a central station so that patients can be seen either through the room windows or from a nursing station a few steps away. Patients are given 24-hour assessments by the intensivist. Preparatory orders for the ICU generally vary from patient to patient since treatment is individualized. The initial workup should be coordinated by the attending ICU staff (intensivist and ICU nurse specialist), pharmacists (for medications and IV fluid therapy), and respiratory therapists for stabilization, improvement, or continuation of cardiopulmonary care. Well-coordinated care includes prompt consultation with other specialists soon after the patient is admitted to the ICU. The patient is connected to monitors that record his or her vital signs (pulse, blood pressure, and breathing rate). Orders for medications, laboratory tests, or other procedures are instituted upon arrival. In general there are eight categories of diseases and disorders that are regarded as medical justification for admission to an ICU. These categories include disorders of the cardiac, nervous, pulmonary, and endocrine (hormonal) systems, together with postsurgical crises and medication monitoring for drug ingestion or overdose. Cardiac problems can include heart attacks (myocardial infarction), shock, cardiac arrhythmias (abnormal heart rhythm), heart failure (congestive heart failure or CHF), high blood pressure, and unstable angina (chest pain). Lung disorders can include acute respiratory failure, pulmonary emboli (blood clots in the lungs), hemoptysis (coughing up blood), and respiratory failure. Neurological disorders may include acute stroke (blood clot in the brain), coma, bleeding in the brain (intracranial hemorrhage), such infections as meningitis, and traumatic brain injury (TBI). Medication monitoring is essential, including careful attention to the possibility of seizures and other drug side effects. When patients are transferred to the ICU from another hospital department, treatment orders and planning must be reviewed and new treatment plans written for the patient's current status. For example, a chronically ill inpatient may grow markedly worse within a few hours and may be transferred to the ICU, where the staff must reevaluate orders for his or her care. Brilli, R. J., A. Spevetz, R. D. Branson, et al. "Critical Care Delivery in the Intensive Care Unit: Defining Clinical Roles and the Best Practice Model." Critical Care Medicine 29 (October 2001): 2007-2019. Ethics Committee, Society of Critical Care Medicine. "Consensus Statement of the SCCM Ethics Committee Regarding Futile and Other Possibly Inadvisable Treatments." Critical Care Medicine 25 (May 1997): 887-891. Truog, R. D., A. F. Cist, S. E. Brackett, et al. "Recommendations for End-of-Life Care in the Intensive Care Unit: The Ethics Committee of the Society of Critical Care Medicine." Critical Care Medicine 29 (December 2001): 2332-2348. American Hospital Association. One North Franklin, Chicago, IL 60606-3421. (312) 422-3000. http://www.hospitalconnect.com . Joint Commission on Accreditation of Healthcare Organizations (JCAHO). One Renaissance Blvd., Oakbrook Terrace, IL 60181. (630) 792-5000 or (630) 792-5085. http://www.jcaho.org/ . Society of Critical Care Medicine (SCCM). 701 Lee Street, Suite 200, Des Plaines, IL 60016. (847) 827-6869; Fax: (847) 827-6869. http://www.sccm.org . please copy this to my file to learn more about critical care nursing. hello I want you to read this very comprehensive article about intensive care unit hope your going to read it. It will help you a lot I know. Just put it in your hearts i know you can do it. God Bless. this article is good but is not suffisient for an intensivist that want to collect information aboat intensive unit . can you help me for this goal? I need a new structure of I.C.U that may you have designed.If you have it,send me please. I need a journaly about osteoporosis and Questions.If you have it send me please. I need all resources for this article.